Bad news for #SalmanKhan Fans, it looks like that the actor might have to spend a few more days in jail as the judge scheduled to hear Salman's bail plea has been transferred. Ravindra Joshi, the Districts and Sessions Judge who was supposed to hear Salman's bail plea, was transferred by the Rajasthan High Court, as reported. The Rajasthan High Court transferred 87 other district judges as well. Ravindra Joshi was supposed to hear Salman Khan's bail plea in Jodhpur Sessions court on Saturday but he was transferred last evening. Salman Khan was sentenced to five years in jail for the killing of two blackbucks in Jodhpur in 1998. 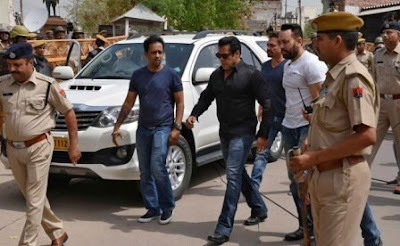 Salman and his co-actors, Saif Ali Khan, Tabu, Neelam and Sonali Bendre were charged under the Wildlife Protection Act for poaching two blackbucks while shooting for Hum Sath Sath Hain in Jodhpur. Actor Salman Khan was convicted and awarded a five-year prison sentence, all his co-actors were acquitted in the 20-year-old case. Salman is currently in the Jodhpur Central Jail. According to the court order that convicted Salman Khan of killing blackbucks 19 years ago, the judge held that the "accused is a famous film actor and deed [sic] done by him can be followed by public." Salman Khan killed two blackbucks for enjoyment, the court observed as it convicted the actor and sentenced him to five years in jail.